Here is a timely office supplies reminder for everyone. November is the month to order your dated goods products for 2012. Most people use some sort of schedule to order the office products they use on a regular basis be it weekly, monthly or something between. But ordering dated planners, wall calendars and calendar desk pads that people need often falls through the cracks as the year flies by. This handy guide gives you all you need to know when it comes to shopping for your dated product needs, especially if you’re someone who orders your office supplies online. First we’ll examine the various brands of dated planners, calendars, appointment books and wall calendars. At-A-Glance has grown into the largest supplier of dated products, and they feature an extensive line of dated organizer, planners, desk calendars, wall calendars and appointment books. They are known for quality and value, and are my personal favorite brand in dated goods. At-A-Glance Monthly Planners are very popular. Try AAG7013005 if you're looking for a great monthy planner. The two next most well known brands are Day Runner and Day-Timer planners. Both have a good product selection when it comes to planners, organizers and appointment books, but neither has a solid line of desk planners, desk pads or wall calendars and planners. As to quality, they both measure out well, although At-A-Glance provides you more for the money and is a little less expensive. My second favorite brand is House of Doolittle, primarily because of their focus on producing the most environmentally friendly dated products on the market. All House of Doolittle products are made from recycled materials including recycled paper, (many times 100% recycled), recycled plastics and they use recycled materials for packaging. Their products are also cool and a little more contemporary than the more established brands. Enough on brands, now let’s discuss products. 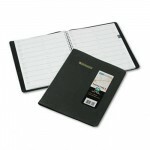 The most popular dated products are simple planners and appointment books. While PDA’s and Smart Phones are dominating the market today and have certainly cut into planner sales, it’s amazing how many people continue to prefer to have their own paper planner to keep them organized. At-A-Glance’s Monthly Planner, (product #AAG7013005) and House of Doolittle’s Academic Monthly Planner (product #HOD26502) are two of the most popular selling models. Next comes Wall Planners and Calendars which are a growing market that has not been affected as much by the new electronic gadgets out there. These wall planners are typically coated with a dry erase surface so you can mark and wipe your important dates and appointments and have them always visible on your office wall. At-A-Glance’s Horizontal Erasable Wall Planner is four feet wide an almost three feet tall for ample writing space, and shows you all twelve months of the year on one easy to view wall planner, (product #AAGPM30028). House of Doolittle's Calendar Desk Pad (#HOD164) is made from 100% recycled paper and looks great on the desk! Last let’s review dated calendar desk pads. I love these because I like to doodle while on the phone, and having a writing surface always in front of me gives me the freedom to jot away. Keeping a calendar right on my desk where it really takes up no room because it’s used as a blotter as well just makes sense. And, dated calendar desk pads these days are under $10! My favorites are House of Doolittle brand because I like to buy recycled products whenever possible. 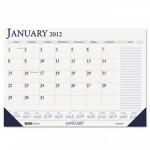 Look for the House of Doolittle Two-Color Monthly Desk Pad Calendar w/Large Notes Section, 22 x 17, (product #HOD164). It looks nice with two color printing, has a large area for notes, and is made from 100% recycled paper. The best way to buy your dated goods is by shopping for office supplies online. There are independent internet based companies out there today who offer lower prices than the corporate office superstores, far better service, and also ship next day. I also prefer companies that practice conscious capitalism, and I’ve found an office supply company that does good work by donating 50% of profits to great charities. Typically the online office supply dealer will give you a better selection of dated goods, at a better price than the Big Box superstores. So don’t delay any longer! The time is now to stock up on your 2012 dated products before the best selection is gone. This entry was posted in Office Supplies and tagged conscious capitalism, Dated Planners, Desk Calendars, office products, office supplies, Office Supplies Online, Recycled Office Supplies, Wall Calendars. Bookmark the permalink.